Like islands rising out of the desert sea, southwestern mountain ranges are refuges for plants and animals that wouldn't otherwise survive here. The Desert Museum has re-created a habitat based on Mexican Pine-Oak Woodland, and the animals are what you might find in many nearby mountain ranges. The Mexican wolf (Canis lupus spp. baileyi) is an Endangered species who once inhabited mountainous areas, woodlands, and riparian habitats of the southwestern United States. ASDM spearheaded a captive breeding program that is bringing the wolves' numbers back from the brink. Now a reintroduction campaign is attempting to restore wolves to their rightful place in the mountains of the Southwest. Listen for the howl of the wolves on your next visit to the Desert Museum, expecially during the spring mating season. Our flock of these amazing native Arizona birds can be seen adjacent to the mountain lion exhibit - in fact our mountain lions can sometimes be seen interacting with these gregarious birds! 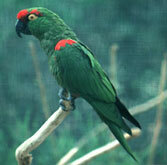 As recently as 1936 large flocks of thick-billled parrots visited the mountains of southeastern Arizona. Today these birds are restricted to the mature pine forests of Mexico's Sierra Madre. These parrots are dependent upon a variable pine seed crop for food, and nests only in the hollows of large dead pine trees. Due to habitat destruction, this bird is an endangered species. 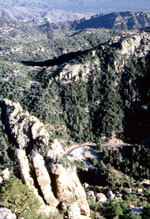 The foothills and lower mountain slopes east of the Sonoran Desert are wooded with oaks and pines, a mixture of coniferous forest and temperate deciduous forest tree types. The oaks, however, are mostly evergreen species; they are not deciduous except during severe droughts. This Madrean evergreen woodland (also called Mexican oak-pine woodland) is a warm-temperate community of the Sierra Madre Occidental. It extends as far north as central Arizona, where it is squeezed out by the cool-temperate Rocky Mountain forests above it and the more arid grassland and desert below. (Though its official name is woodland, in its southern part it's actually a forest; i.e., the tree canopies overlap.) This is a semiarid community which experiences a dry season in spring.